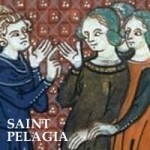 Friends in Christ, back in the 4th century in the city of Antioch there lived a woman named Pelagia. Pelagia was the most famous actress of that city, with many admirers; she lived a scandalous life, and she was considered a harlot. no one ever stopped talking about her. One day, the holy bishop Nonnus was with some other bishops, when they saw, riding by on the street, Pelagia. She was dressed in a provocative manner, with many fans following her. Seeing this, Nonnus said, ‘brothers, how many hours a day does this woman spend on making herself beautiful to please her admirers, and yet Christians spend such a small amount of time and effort to make their soul pleasing to Christ Jesus. She promises to please her lovers, but haven’t we promised to please God? Later that day, Nonnus knelt and prayed with all his might for Pelagia. When Sunday arrived, the Bishop spoke a homily at Mass about the Last Judgment, and the need to seek God’s mercy. Now it happened that the Lord had guided to that Church, none other than Pelagia, the Actress. 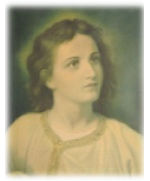 Never before had she entered the house of God and never before had she even thought of her sins; but suddenly her heart was pierced with God’s love. Her tears flowed in such a flood that she could not control them. She threw herself on the floor and holding the feet of the bishop said: ‘I beg you Father, pour out on me your goodness and make me a Christian. All the people were amazed and said that they had never before seen such faith as in this harlot. Friends, today Jeremiah warns us to change our ways. To turn from sin. And the Psalmist says to us: ‘If today you hear his voice, harden not your heart.’ We are being called ourselves, to reform our life during Lent. The first part of Lent emphasizes repentance, conversion of life, atoning for our sins. The 2nd part of Lent will bring our minds to contemplate all that the Lord Jesus has done for us in his Passion.